The purple wrapper of these Jammy Dodgers caught my eye in the supermarket, so I picked up a couple of packets. 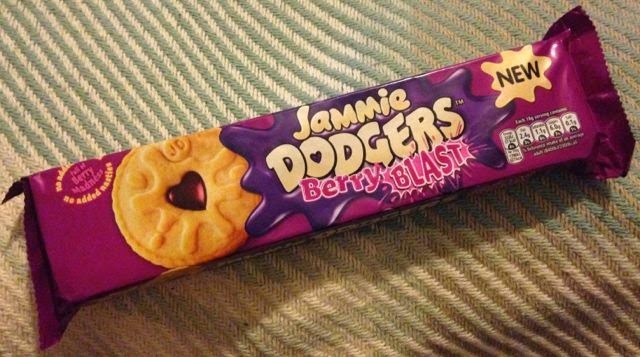 This Berry Blast flavour looks quite similar to the original variety of Jammy Dodgers, but with a purple jam instead of the traditional red one. 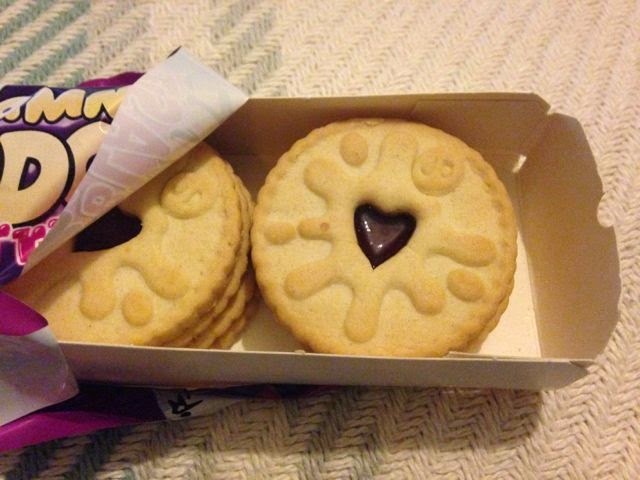 You can see the purple jam as it appears in the cute Jammy Dodger heart cut-out on the biscuit. When they were out of the packet they still had the look and feel of the regular Jammy Dodgers, and the purple jam was still pleasingly sticky if you attempted to prise the two layers of biscuit apart. The biscuit part has no new added flavour, it is the usual pure biscuity buttery taste. The jam however although sweet has a nice sharpness from the Berry Blast. The jam is predominantly blackcurrant in its taste, which is nice and zingy, and such an underestimated fruit. These are a nice twist on the regular Jammy Dodgers, they are just different enough to be interesting, without putting off the hardened Dodger fans. I love that blackcurrant is showcased in these biscuits, it feels a very British fruit and as such it is nice that it features in such an iconic British biscuit. Win - Thorntons Chocolate Hamper!! !